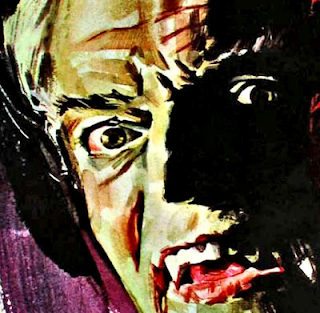 Jess Franco's Drácula contra Frankenstein certainly isn't a shining moment in the late director's filmography. It's cheap and schlocky with all kinds of dubious filmmaking choices and inebriated actors. Or yeah, the classic junk Franco was known to churn out in order to continue eating between striking upon flashes of real genius behind the lens. Unless you must in your Jess Quest or wish to torture a Hammer fan into total submission, tread with extreme caution. Regardless, Dracula:PoF's dodgy quality didn't prevent this Japanese VHS release from becoming damn rare. 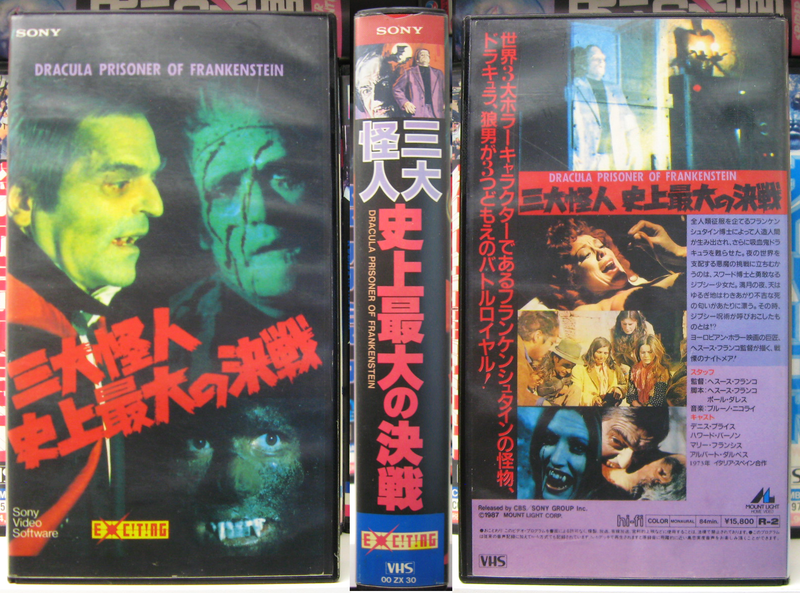 According to a trusted friend who specializes in the country's VHS output and has owned many of the rarest, only about five have surfaced in collector circles with only one displaying zero UV damage. Unfortunately during its lifespan that particular copy had a hard crease applied to its cover running in-between the spine and the front. The copy below that I was lucky enough to purchase a few weeks ago might be in the best overall condition to ever appear. The spine has an extremely soft touch of fade, but otherwise it's in mint shape with no creases, stickers, or cassette damage. This very nice, uncut English language presentation is also special for being the only release so far to present the film in its original 2.35:1 Techniscope widescreen aspect ratio. For some unknown reason, even the few DVD releases feature zoomed-in 1.85:1 presentations. In a nice touch, the Japanese subtitles are placed out of the actual frame with the picture moved up slightly to accommodate the text.